Bus services will be affected by the closure of the Parade in Leamington from Sunday October 16 to Friday October 28. The lower Parade from Regent Street to Dormer Place is due to be resurfaced so buses will be unable to serve the upper Parade stops for the duration. As a result, all bus stops on the Parade will be suspended for the duration and Guy Street, near Argos will be used as a temporary boarding and alighting point. 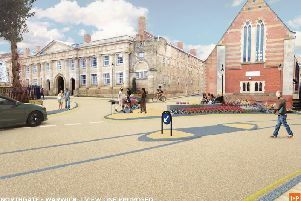 The stops on Victoria Terrace outside and opposite All Saints Parish Church will remain in operation and all parking along Guy Street will be suspended, including the disabled bays - which will be enforced by the Warwick District Council’s contractors. All relevant bus companies have been informed and some delays may be encountered due to the alternative route being used which will follow a route along Victoria Terrace, Newbold Terrace, Newbold Street, Hamilton Terrace, Regent Grove, Clarendon Street, Warwick Street, Guy Street and reverse. A letter is going out to all affected residents and regular progress updates will be available on Warwickshire County Council’s website via @WCCBusServices or from the new instant email alerts system that you can sign up to by going to www.warwickshire.gov.uk/buses and following the link at the top left of the screen.